You are here: Home » Something’s fishy when a tart can crumble and squash a crusted snow pea! 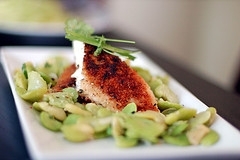 Something’s fishy when a tart can crumble and squash a crusted snow pea! Check your cupboards and fridge/freezer to see if you have everything needed. In preparing for grocery shopping your first job has to be listing all the ingredients required for your planned meals. The trick with trying to work within a very tight budget is to keep on top of the specials at local grocers and be familiar with the regular, current prices of ingredients you tend to use the most. You must know, in advance, whether the signs enticing you to buy a particular item is, in fact, a special price or the regular price and the store just wants to unload it. In downtown Montreal, for instance, this week’s flyers from Mourelatos http://www.grocerysavings.ca/onlineGroceryStores/Quebec/MourelatosStoreFlyer.asp and PA http://www.supermarchepa.com/eng/specials/fort/page1.html include specials on items from this week’s menu. But, beware! Read the flyers carefully, become a good hunter and compare specials because while one store’s special seem good, another could be much better. For instance, this week’s menu includes fish as a main course with a suggested type from sole/cod/haddock. Both PA and Mourelatos have included cod in their flyers. The difference is significant with PA’s price at $14.31/kg ($6.49/lb) while Mourelatos’ price is $8.80/kg ($3.99/lb) which is a big difference and has quite an impact on your budget! The price of lemons at PA is $1.69/2 lb and Mourelatos is 0.99/5 lemons. Will you use all 2 pounds or will they go bad? You have to weigh up the advantage of going to a number of stores especially if you are driving. There is a false economy of driving to a number of different stores to save $1 or $2. The price of gas has to be calculated in your expenses as does your time. If you live in town or have a few stores within walking distance, pay attention to the specials frequently advertised on window signs in addition to the flyers. When you are planning your week’s menus consult your file of recipes. Go through the flyers and decide what will provide you with the most economical variety of meals for the next week. If you have something special you know you will be making in the next couple of weeks and you see an ingredient at a spectacular price (and that item will not become a chemistry experiment before you get to it) then work it into your week’s budget. What you spend this week might save you next week. Be imaginative. If the recipe calls for snow peas but the price of green beans is the more affordable then make the switch. There is wiggle room as to mix or type of ingredients such as regular breadcrumbs instead of Panko crumbs or tinned peaches instead of fresh if you can’t find fresh at an affordable price and if you don’t like cilantro then replace it with parsley. For the most part recipes are an idea with guidelines. Don’t mess with proportions in things like sauces or breads because they are actually carefully calculated to obtain the desired consistency or loft (such as the amount of flour and baking powder needed to make bread). Don’t be intimidated by cooking because it can be easy, fun . . . an adventure with a reward at the end! Cut squash in half lengthwise, scoop out seeds and place cut side down on a baking sheet covered with either parchment paper OR foil. Roast the squash for 40-45 minutes or until it is very tender. Allow squash to cool. While the squash is roasting, sauté the onion, ginger and carrot in the butter and oil over a medium heat until the onion is translucent and soft. Add the broth, cover and simmer for 10 minutes. Place half the squash and half the broth in a blender, purée until smooth. Repeat with the other half of the squash and broth. If needed, add water to achieve the desired consistency. Return the soup to the saucepan and reheat. Add salt and pepper to taste. If desired, garnish each serving with a spoonful of sour cream. Sprinkle with grated apple topped with toasted pumpkin seeds. This is a fabulous and easy change from breaded fish, and you can use any fairly thin skinless fish fillets, such as pickerel, catfish, sole, trout, turbot or any whitefish. Choose fillets that are approximately even in thickness as that will aid in even cooking. The fish should be fully cooked just when the almonds are nicely toasted. Preheat oven to 400°F (200ºC). Lightly oil a wire rack large enough to hold fillets in a single layer. Place the rack on a baking sheet and set aside. In a shallow bowl, mix the flour, salt, and cayenne and black pepper together. Whisk together yogourt, egg plus egg white and mustard powder in another shallow bowl until creamy. Put almonds into a food processor; process until the almonds are finely chopped, ± 1 minute. Empty into another shallow bowl and mix the almonds with the Panko crumbs. Dip each fillet into the flour mixture to coat both sides. Dip into yogourt/egg mixture then roll in almonds to coat all over. Set on the prepared rack; they should not touch. Bake until lightly browned on the outside and opaque in the center, 15 to 18 minutes or until the fish is golden brown and is firm. Plate and sprinkle with sea salt to taste. Serve with lemon wedges. This combination of vegetables offers a spectacular variety of colour, flavour and texture. A quick and versatile side dish to any meal. Steam peas, pepper and carrot in a microwaveable bowl with 2 tablespoons water until just tender. Drain excess water. Toss with soy sauce, oil and pepper. Put in a serving bowl and sprinkle with sesame seeds. Serve with your choice of starch such as mashed potatoes, rice or pasta. In large bowl combine well drained peaches (canned peaches can be used off-season) with blueberries. In a separate bowl combine sugar, flour and spices. Sprinkle over fruit and toss together gently to ensure even coverage. In medium bowl, combine oats, flour and sugar. Cut in butter until evenly crumbly. It may be necessary to gently crumble with your fingers. Cream sugar with butter, add eggs one at a time. Gradually add the flour until dough forms a soft ball. – Preheat oven to 375ºF (190ºC). Spray a large muffin pan (12 cavity) with cooking spray or grease lightly with oil. Divide the dough into 12 balls. Drop balls into prepared muffin cups. With wet fingertips, press the dough evenly into the muffin cups. 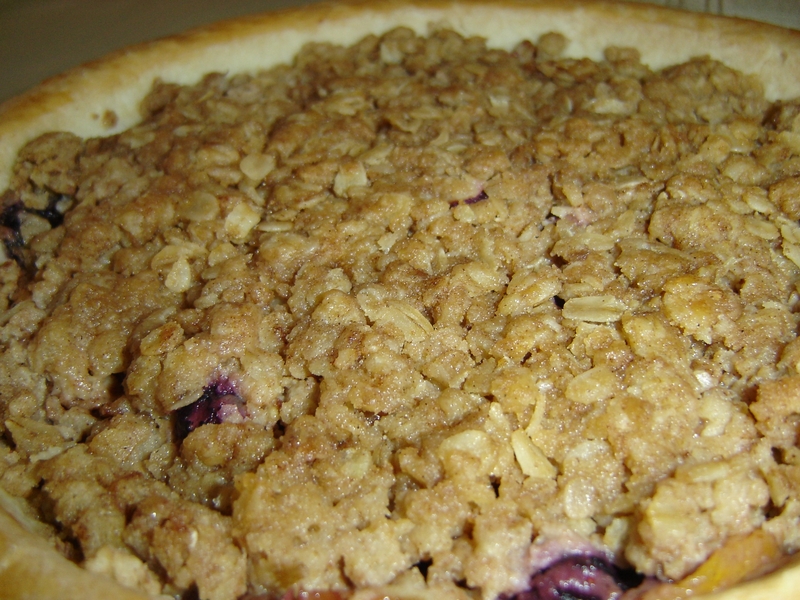 Gently scoop the peach and blueberry mixture into the prepared (unbaked) tart shells. Sprinkle evenly with Crispy Topping. Place muffin pan onto a foiled baking sheet to catch any boil-over spillage. Bake for 50-55 minutes or until crispy topping is browned and filling is bubbling. There is no shame in using the premade frozen variety of tart shells. Follow the instructions on the box. ← There is nothing wrong with disabled people!